Labels: don't blame me I failed philosophy, don't blame me I use FEDEX, haters gonna hate, home for the holidays? KPC 2013 music fave Speedy Ortiz is back with a new album in April. Here's the first song they've released from said album. Sounds like the lovechild of Liz Phair and Steve Malkmus, no? This is good stuff people, don't snooze! Angus has been a voice in the wilderness for years, calling our attention to the world-wide scourge of owl attacks. If a toddler has one, in fact, there is real danger. 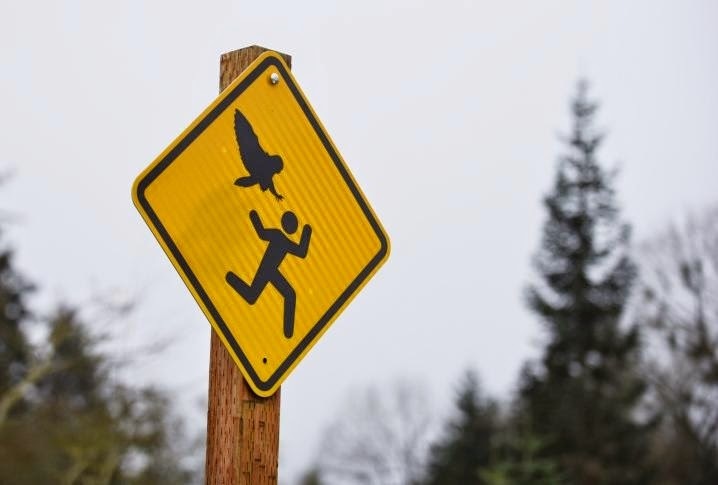 But can it really be a "thing," to the point that there are signs warning of owl attacks? Twin Brothers from Different Mothers? 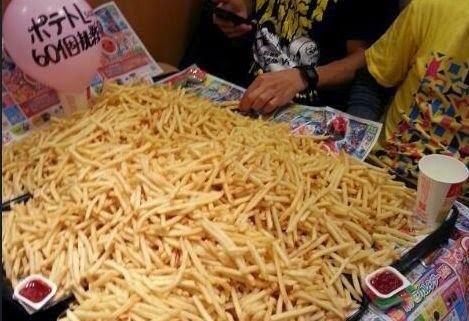 So McDonalds is running a big sale on French Fries in Korea and Japan. And apparently some young people have a very elastic demand curve for fries. these kids have been getting a lot of heated criticism on social media for these "stunts", but people, come on. This is awesome. It's better art than anything Ai Wei Wei has done in years and it's just not hurting anybody (yes I know "crowding out" and all that but please). 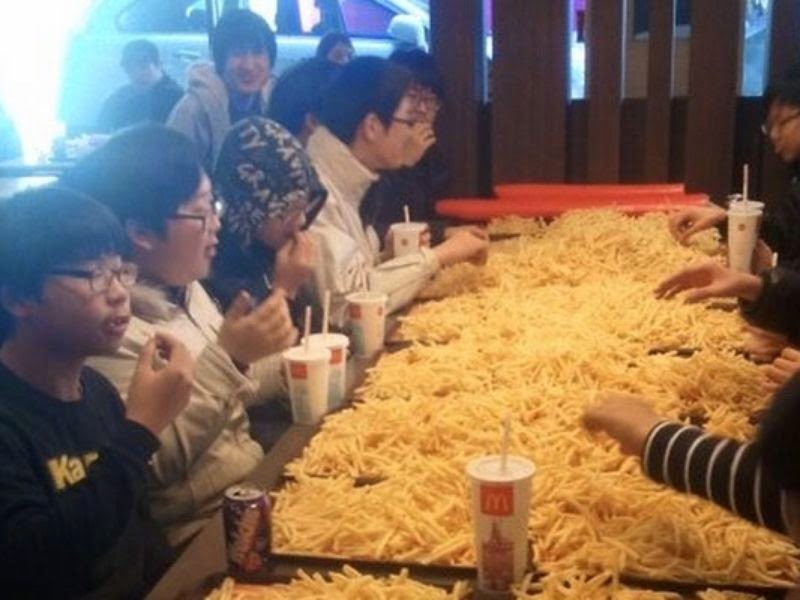 So I salute you, cheap fry loving Asian youths! Long may you reign, and watch out for diabetes and hypertension. Labels: the culture that is Japan, Why do I need TV when I got T-Rex?, you want fries with that? A friend of ours is developing an area that will be called "Wetrock Farm." It sound pretty interesting. Durham is actually a very nice place, becoming more so recently. I think the change dated to Angus and Ms. Angus staying here, nearly 10 years ago now. That had to be it... Hipsters attract hipsters, it's a law of nature. Markets in Everything: Uncle Boonmee edition? Thailand is a fascinating country that I very much plan to visit again. This past weekend, Tyler convinced Mrs. A and I to watch "Uncle Boonmee who can recall his past lives" on Netflix. It's different and to American eyes way out there, but we loved it. Lyrical and funny, with many scenes as beautiful and moving as I've ever seen. I'm looking forward to checking out the director, Apichatpong Weerasethakul's other films as well. I'd call him the Jim Jarmusch of Thailand. 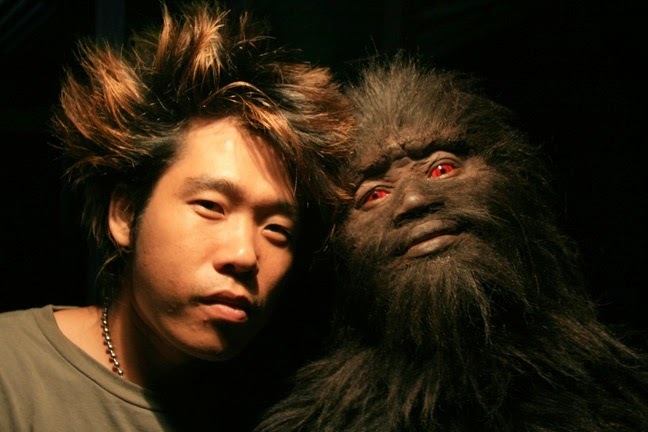 "There are more than 100 types of ghosts in Thailand, he says, including the Pi Pob, which enters human bodies and possesses them; the Preta, a tall, thin ghost that seeks vengeance among the living; Phi Lung Kluang, a variety from southern Thailand that takes a human form with a hole in its back, exposing its skeleton; and widow ghosts, prevalent in northeastern Thailand, which seek to steal men away from their families. The belief in the supernatural, ghosts and otherwise, infuses daily life in Thailand. Ministers inaugurate their offices at auspicious times, and powerful generals have been known to consult seers before a big decision, such as launching a coup — a relatively regular occurrence in Thailand. Fortune tellers are consulted by everyone from business executives forging multimillion-dollar deals to students facing uncertain careers and couples wanting to conceive." Clearly, Jerry is a vampire, a continuation of the life-force of Liszt from long ago. Not sure about that grad student, though. Looks confused with his head all cocked over like that. 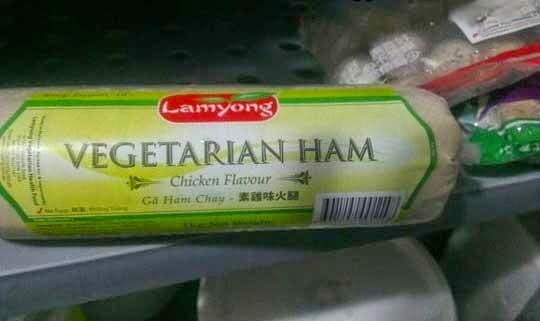 Let me see if I got this straight, Chicken Flavored Vegetarian Ham? People, if crap like this can happen, why do we even have a government at all? Gosh, Who Would Have Thought? Peter Overby did this story this morning on National People's Radio. 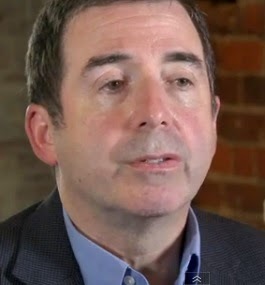 In it, he laments the fact that McCain-Feingold has destroyed party structures, especially in the states. But when I tried to make this case, in my Senate testimony before the Rules and Admin Committee, in April of 2000, it didn't get very far. The thing is that it was absolutely clear--fifteen years ago!-- that the BCRA was a party-killing incumbent protection bill. That Caesar of the Senate, John McCain, just finds competition very inconvenient. It's not an accident that now most contributions to candidates, and therefore to incumbent candidates. So, forgive me. But I TOLD YOU SO. We even did a letter, fergoshsakes. Students don't come to Friday classes. This is freakin' Harvard. It's much worse at State U. Plus, 50 minute MWF classes are a hard way to get a lot of material covered. Between the settle down and the throat clearing and the review and the get-away, you got like 35 minutes to do real business. There's just no need for them. Schools should go MW and T/Th and be done with it. Friday's are for seminars, grading, meeting with your advisees, and having lunch with some colleagues. I almost always find myself inspiring. Is that so WRONG? Abstract: Inspiration is a source of admirable creation — but where do people get it from? We propose that power allows individuals to draw inspiration from the self. Four studies involving different social settings and operationalizations support this idea. Study 1 revealed that greater power is associated with more self-derived inspiration and less other-derived inspiration. In Study 2, participants with a higher sense of power were more inspired by their own than by their partners’ stories in face-to-face conversations, whereas lower power participants were not. In Study 3, higher power people spontaneously generated more inspiring stories involving themselves than did lower power people. Finally, participants in Study 4 felt more inspired after writing about their own experiences than after writing about someone else’s, especially after having been primed with high rather than low power. These findings suggest that powerful people prioritize themselves over others in social interaction because this is emotionally rewarding for them. Nod to Kevin Lewis, who also inspires me. The woman didn't know she was pregnant. And the baby weighed 14 pounds. Speculate about the set of things that would have to be true for those facts to go together. But both appear to be healthy, and that's the main thing! As always, so proud of Florida. Watched "The Drop" last night with Mrs. Angus and Tyler. At its core, the film is a geo-political morality play where the US impresses China but horrifies Europe by killing Putin (and admitting to having done such killings in the past). However, the US has a very cute puppy and Europe comes back to us in the end. In his last ever role, James Gandolfini plays Japan. Tyler seemed to think it was about the external benefits of gentrification, but what does he know? I'm pretty sure Tyrone agrees with me.